FUEL EFFICIENT 28 MPG Hwy/21 MPG City! Extra Clean. Moonroof, Multi-CD Changer, iPod/MP3 Input, Aluminum Wheels, Non-Smoker vehicle READ MORE! KEY FEATURES INCLUDE Sunroof, iPod/MP3 Input, Multi-CD Changer, Aluminum Wheels MP3 Player, Keyless Entry, Privacy Glass, Child Safety Locks, Steering Wheel Controls. Honda EX with Alabaster Silver Metallic exterior and Gray interior features a 4 Cylinder Engine with 180 HP at 6800 RPM*. Non-Smoker vehicle. VEHICLE REVIEWS KBB.com explains Few vehicles do as many things as well as the 2011 Honda CR-V.. EXCELLENT SAFETY FOR YOUR FAMILY Electronic Stability Control, Brake Assist, 4-Wheel ABS, Tire Pressure Monitoring System, 4-Wheel Disc Brakes WHY BUY FROM US At Honda of San Angelo in San Angelo, TX, we know cars. Better yet, we also know customer service. Want proof? Stop in today and allow us to demonstrate our commitment to excellence. Your perfect car, truck, SUV or minivan is just around the corner. Sure, the X1 xDrive35i has space for pretty much anything you decide to bring along, but more importantly it has unrivaled performance. And the proof is in the numbers. Its 6-cylinder, 300 hp engine takes you soaring from 0-60 mph in only 5.3 seconds. If you want a three-row crossover that melds family-friendly functionality with a thoroughly enjoyable driving experience, you won't do better than the Mazda CX-9. -- Edmunds. Plus TT&L and fees. See dealer for details. Extra Clean, GREAT MILES 69,951! FUEL EFFICIENT 31 MPG Hwy/23 MPG City! Alloy Wheels, REAR SPOILER, iPod/MP3 Input, Panoramic Roof CLICK ME! KEY FEATURES INCLUDE Panoramic Roof, iPod/MP3 Input, Aluminum Wheels MP3 Player, Keyless Entry, Steering Wheel Controls, Child Safety Locks, Electronic Stability Control. OPTION PACKAGES TRD EXHAUST, XM SATELLITE RADIO W/TRAFFIC, PREMIUM PIONEER AUDIO SYSTEM, XM SATELLITE RADIO, REAR SPOILER, FOG LIGHTS. Scion tC with Black exterior and Dark Charcoal interior features a 4 Cylinder Engine with 180 HP at 6000 RPM*. Non-Smoker vehicle. EXPERTS ARE SAYING CarAndDriver.com's review says Scion's handsome coupe offers a sporty feel at a good price. The interior is comfortable and well appointed, the seats hug the body, and the engine's exhaust barks out a nice mellow sound.. 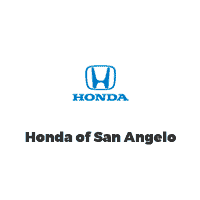 EXCELLENT SAFETY FOR YOUR FAMILY Brake Assist, 4-Wheel ABS, Tire Pressure Monitoring System, 4-Wheel Disc Brakes MORE ABOUT US At Honda of San Angelo in San Angelo, TX, we know cars. Better yet, we also know customer service. Want proof? Stop in today and allow us to demonstrate our commitment to excellence. Your perfect car, truck, SUV or minivan is just around the corner. Sure, the X1 xDrive35i has space for pretty much anything you decide to bring along, but more importantly it has unrivaled performance. And the proof is in the numbers. Its 6-cylinder, 300 hp engine takes you soaring from 0-60 mph in only 5.3 seconds. The 2012 Mazda CX-9 features a cabin that's stylish and elegant, with a look that's more high end than that of many others in this segment. -- Edmunds. Lots of extras! If you are looking for a fun fuel efficient ride you need to take a look at this one! Plus TT&L and fees. See dealer for details.